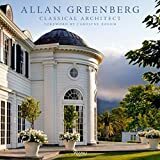 Allan Greenberg is a prominent architect and scholar who has championed the relevance of classical and traditional architecture in his teaching, writing, and designs. Unlike his peers, Greenberg’s stance and talents were formed outside of the American academy. Indeed, the strength of his work and its influence have taken shape in ways that rarely mirror the trends in postwar American architectural theory.